Disclosure: This post is sponsored by GIANT and this post contains affiliate links. All opinions are my own. See this Savory Magazine? Every month I look forward to getting my hands on the newest copy. And every month I am blown away by all of the new ideas I come across in each issue. It’s jam packed with easy to follow recipe ideas, beautiful color pictures, money saving coupons and awesome cooking tips. Best of all, the magazine is FREE at GIANT with your savings card! It’s like getting a little gift at the end of your shopping trip every month. (I love it!) 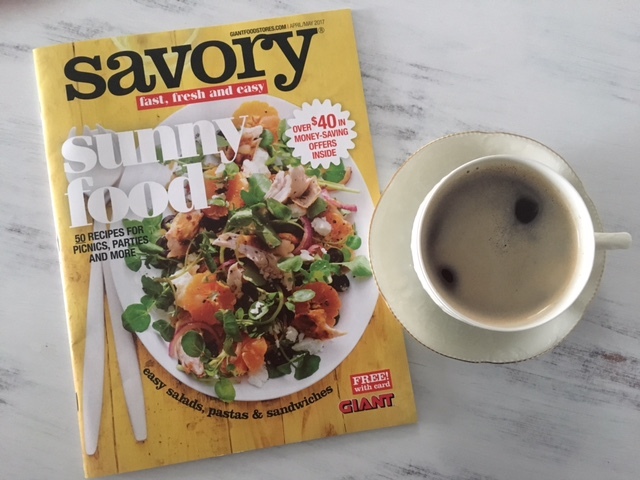 If you shop at GIANT and have not checked out Savory magazine for yourself, do yourself a favor and be sure to grab a copy next time you are shopping! Anywho – While flipping through this month’s copy, a few decadent crepes recipes caught my eye. 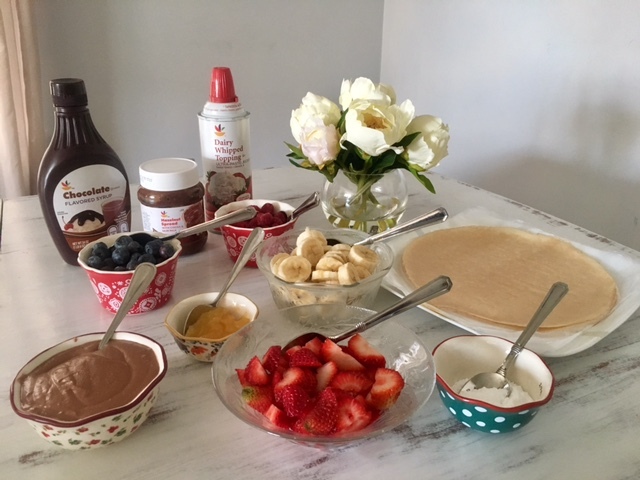 With Mother’s Day just a few days away, it got me to thinking how much fun it would be for the kids to be able to create and prepare Mother’s Day Brunch themselves this year. 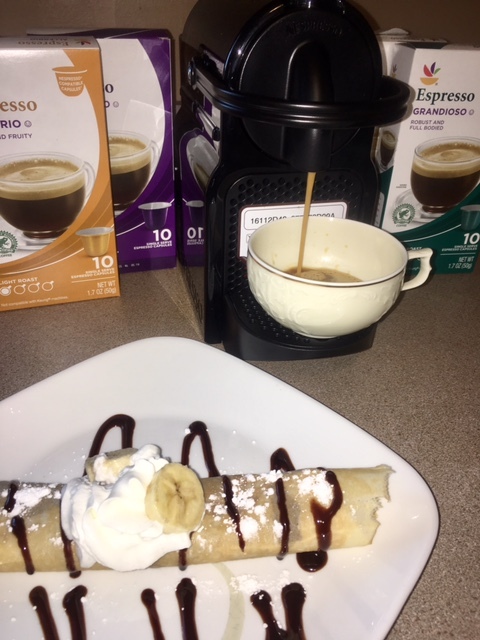 After brainstorming a few ideas together with them, we came up with what we think is a pretty fun yet simple idea that the whole family will enjoy – a Crepes and Coffee Bar! I think this is such a versatile idea that would not only work for Mother’s Day but could be customized to work anytime of year! 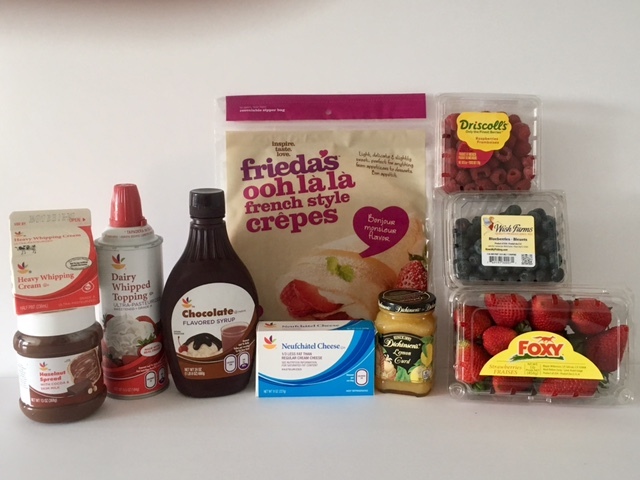 For our Crepes Bar, we are choosing to splurge and take the sweet route. But crepes can also be made savory by incorporating variations such as eggs with sausage, brie and apples, asparagus, ham and gruyere cheese, turkey and swiss and don’t forget fresh herbs! Crepes are also yummy filled with delicious salads – especially delicate chicken salads garnished with pieces of fruit. Dependent upon how many people you are serving and how extravagant you would like to get, a crepes bar can be varied as much or as little as you like to suit the crowd you are entertaining. Since my daughter (the self-proclaimed food scientist) loves to experiment with food, we decided to create a little chocolate hazelnut mousse by whipping some heavy cream, along with a bit of cream cheese and chocolate hazelnut spread. We find that sometimes it is fun to play trial and error rather than follow a recipe so we added a little of this and that and tasted as we went, put in the refrigerator to set and continued on with our prep work! (Here’s hoping that it turns out as planned!) Don’t be afraid to experiment with fillings and toppings. That is certainly part of the fun! And just as a tip, we have found that GIANT’s Own Brand products are wonderful for baking and entertaining – and they are often less expensive, leaving a little extra cash in the budget for other entertaining needs. Gather a bunch of small dishes or plates and spoons as well as a cutting board or plates for slicing. Rinse and drain all of your berries well before placing into individual bowls. Rinse and drain strawberries, slice and place into bowl. Slice bananas into rounds and place into bowl. Add condiments such as lemon curd, raspberry sauce, fresh whipped creams, mousse, chopped nuts, chocolate shavings or any other types of fillings you may be serving into bowls. If you want to get fancy and really impress Mom, fresh or artificial flowers are sure to brighten the table setting. Adding little personal hand written notes from each of the kids (and Dad too) or little handmade cards or pictures are also wonderful ideas for table décor. Moms always love special touches – especially ones that are made with extra special love. Next up – get creative and have some fun! The kids are sure to have a blast mixing and matching and getting creative with fun crepe combinations. Best of all, the kids can take Mom’s order and surprise the guest of honor by serving her at her very own special table set just for her! Queen for a day! I am loving this theme! But what better to go with these delicious crepes than a lovely cup of fresh brewed espresso? Since we know Mom is always on the go, what better way to encourage Mom to stop to relax and savor the day than to treat her to the elegance of a fine café right in her own home. With the rich bold flavors of GIANT’s own line of Italian-style blends of Espresso – Allegro (a lightly roasted espresso with sweet, wispy, fruity notes and a touch of acidity), Fortissimo (a mysteriously dark roasted espresso with a rich, creamy body and intense flavor with hints of cocoa and intrigue), Grandioso (a deeply rich espresso with a robust, full bodied flavor and a pleasant, bold earthy aroma) and Leggiero Decaffeineto (a mysteriously dark roasted espresso with a creamy body and intense flavor with hints of cocoa and intrigue without all the caffeine), Mom can enjoy specialty coffee made with extra special love from her very own very special barista. Mom can enjoy a nice bold Espresso straight up or you can treat her to something special such as a Café Au Lait, Latte, Mocha, Cappuccino, Flat White or whatever tickles her fancy. Pinterest is a great place to go to find tons of specialty espresso coffee drink ideas and recipes. Check the coffee aisle at GIANT for special coffee sweeteners and coffee syrups or I’ve also had great luck finding specialty coffee syrups and additives at Home Goods, Marshalls and Ross. If Mom likes things basic, maybe just pull out an extra special cup and saucer or “Mom” mug for the occasion and offer to bring her coffee to her – and don’t forget to offer her refills! Keep in mind – when it comes to planning a special day for Mom, it doesn’t have to be fancy or fussy, expensive or over-the top. Just use your heart and have some fun and do anything you can to make Mom feel extra special – and I can guarantee that it will be the very best gift you can possibly give her. Because as a Mom I can honestly say – the best gift in the world that my family can ever give is to tell me they love me – because my family is all the gift this Mom could ever need or want – and everything else is just icing on the cake. (or should I say – whipped cream on the crepes). Here’s to you, Beautiful Moms! 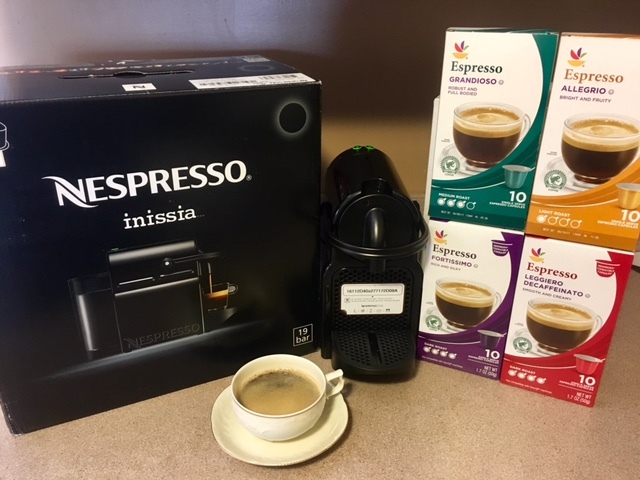 And as a tribute to all of the hard working Moms out there, GIANT is generously giving away a NESPRESSO Machine and assortment of GIANT Nespresso Compatible Espresso Capsules to one very lucky Delco Deal Diva Reader! Simply enter via the easy Rafflecopter below. Winner will be selected on May 26, 2017. Good Luck! We are going out to brunch! I like my Espresso black – and would like to try Allegrio. We are going out to lunch for Mother’s Day. Hoping to be taken out for Mother’s Day! I plan on relaxing by not cooking. I’m hoping we go out to a nice dinner, maybe scallops! I like my espresso rich and creamy. I would love to try the Fortissimo. I’m probably going to sleep in since I no longer have a mother .. I’m excited to try to Fortissimo blend. I’m hoping to take a long nap and have dinner made for me. I doubt it will happen but a girl can dream! Celebrating mothers day staying home and making a special meal for mom…… I like my expresso light and creamy. I love so many styles of espresso but my favorites are mocha or macchiatto. I’ll go with Grandiosso. I prefer my espresso rich and black , I am most looking forward to trying Grandioso . I plan on a spa trip with my sister. I’m hoping to visit with my grandson on Mothers day. That would be my favorite thing to do. I like my espresso bold and dark, so I think I would like to try the Grandioso. Thank you. probably a quiete day..no menu plans..ill wing it…..im boring sorry! I plan to relax by letting my son and husband take over and do all the cooking for the day. I’m not really sure what they have on the menu but I’m willing to bet it’s going to be to take me out for dinner :). I’m taking my mom out for dinner and going hunting at every flower shop to find her favorite flowers…peonies. We’re definitely sharing this with our peeps. Thank you for hosting a giveaway! My wife had to work on Mother’s Day so we celebrated on Monday. I made her favorite, my homemade pizza! I like my Espresso dark and would love to try the Fortissimo! Coffee is definitely on the Mother’s Day menu. Also just relaxing around the house. I am looking forward to trying Grandioso and I like my espresso with cream in it. Our kids picked up my favorite carryout since I was under the weather and we watched tv and had our favorite Japanese! We had planned on grilling at the park for Mother’s Day, but the weather was terrible so we postponed it. Me and the kids took my mother out for a nice brunch this last Mother’s Day. It was very nice. I love my Espresso black as of now. I am really looking forward to trying the Fortissimo. I didn;t get a chance to do anything for Mother’s Day except work. I tend to prefer my espresso in a latte much to my husbands chagrin. I definitely want to try the Fortissimo espresso from Giant!